Muthyala Maduvu popularly known as the Pearl Valley is a beautiful picnic spot that lies in the outskirts of Bengaluru. This tourist spot is located at a distance of 5 Kilometres from Anekal and 40 Kilometres from Bengaluru. This quiet and peaceful place surrounded by nature is a perfect getaway from the loud and noisy Bengaluru. Pearl Valley as the name suggests is situated within a valley nestled between beautiful hills. This is an ideal picnic area for those of you who are looking for a day’s break from the busy schedules in Bengaluru. Surrounded by a beautiful mountain range, the main attraction of Pearl Valley or Muthyala Maduvu is the mesmerizing waterfalls. 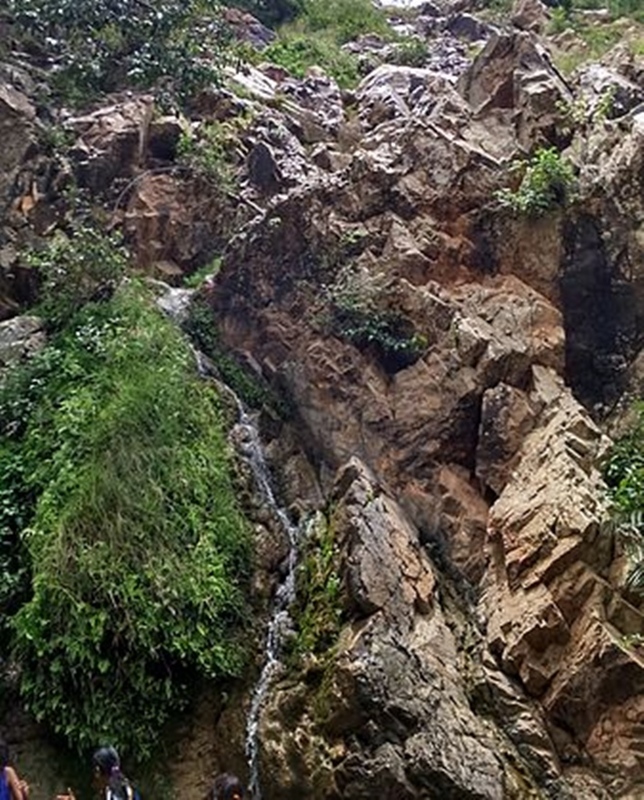 The main waterfall in Pearl Valley is a gushing stream that flows down from a height of 92 meters. The waterfall has its origins in Onakanahalli which is a tank situated nearby. The water rushes down the flora of this place and this creates an illusion which appears to be like strings of pearls. The drops of water from the fall that is scattered across the surface of the rocks gives the appearance of scattering pearls and hence the name Pearl Valley. The gurgling waters that rush through the rocks are quite soothing to your mind and soul. Waterfall: The major attraction of Pearl Valley is, of course, the waterfall. The peaceful ambiance, the beautiful cascading falls and the greenery that surrounds this valley attracts tourists from all over the country to Pearl Valley. Shiva Temple: Within the vicinity of this waterfall lies a temple which is dedicated to Lord Shiva. This temple is also well frequented by the travelers who visit Pearl Valley. A puja which is a religious ritual happens here every morning. Trekking: This spot is also ideal for trekking and hence quite popular among trekkers. The mountain ranges and the open forests present good opportunities for trekkers. They can have an adventurous time trekking through the hilly areas covered in greenery. A walk through Pearl Valley: There are two different waterfalls in Pearl Valley. A flight of around three hundred steps downwards takes you to the first waterfall. The steps start being wet and a bit slippery as you go down. Hence you have to be careful. You’ll be surrounded by greenery and can see rocks, and small ponds as you go down the steps. The chirping of birds is a welcoming sound. The first waterfall and the Shiva temple lie close to each other. You have to travel a distance of 500 meters through the hilly forest area before you reach the next waterfall. Except for a few monkeys, the forest is safe to walk through. The distance could seem longer as you have to go through bumpy and rocky paths. However, the view of the waterfall and the beautiful nature that surrounds it makes this walk worthwhile. The Pearl Valley has a wide variety of birds owing to the presence of the waterfall. There is also a wide range of flowers and lush green plants and trees that make this place extremely beautiful. No wonder this place is a favorite among bird-watchers, nature lovers and ornithologists. There is a small pond at towards the base of the waterfall which has enough shade. Considering that the water is not too deep you can have a great time swimming there with your friends and loved ones. Towards the top of the waterfall lies a Nilgiri Plantation which is an ideal spot to spend your time resting on a hot and sunny day or afternoon. Even though there are a few restaurants near Pearl Valley including a privately run KSTDC restaurant and a few shops where you can get food. Most of the travelers pack up their food so that they can enjoy a good meal in the company of their friends and loved ones somewhere closer to the waterfall or a good spot on the way to the waterfalls. There is also a public toilet facility available for people traveling to Pearl Valley. Warning: Plenty of monkeys are seen in this area. Be careful about your food packets and other valuables so that you don’t end up losing it to the monkeys which are quite common here. Fee For Entry: There is no entry fee to Pearl Valley. However, you have to pay an amount of Rupees 30 as a toll to enter a barricade. Keep in mind that this toll fee is not set by the government. You’ll also have to pay an amount of Rupees 10 as parking fee too. Best Time To Visit: Even though you can visit this spot during any time of the year the best time would be to visit it during the rainy season or just after that. During this time the waterfall looks alive and perfect as there is more water. Much of the water dries up during the summer season and you wouldn’t be able to appreciate the beauty of the waterfall completely. How To Reach Pearl Valley? Make a right turn on the Anekal-Thally road to reach Pearl Valley. You can also reach Anekal through Attibele using the Hosur Road. However, the distance is slightly longer. Kempegowda International Airport, Bengaluru is the nearest airport. From here you can take a private taxi to reach the place. Bangalore City railway station is the closet railway station to the place. You can avail a cab from here.